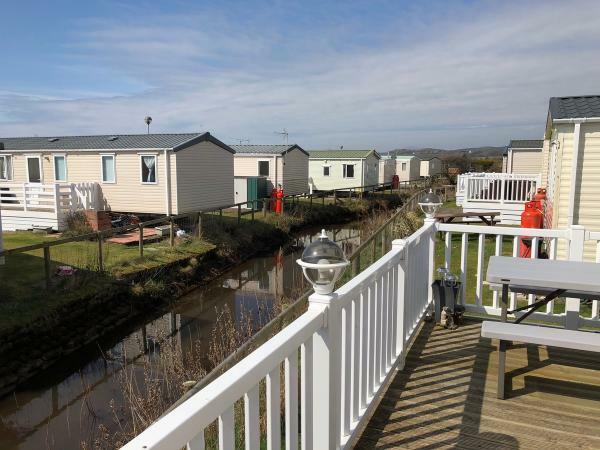 Holiday home for rent on Greenacres Holiday Park. We are situated on Pear Drive near the beach and 5 minutes from the main complex. 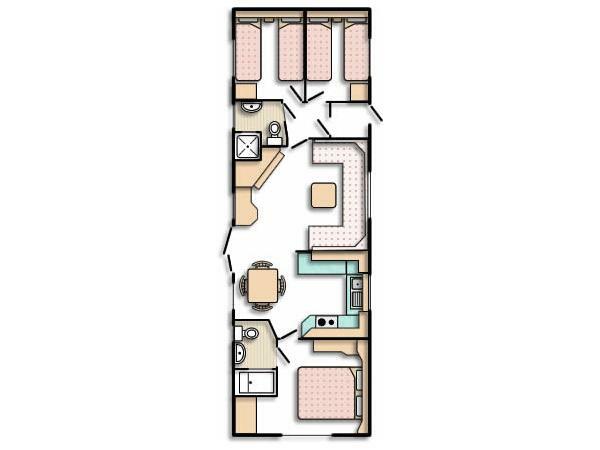 We enjoy an open plan layout with 3 bedrooms including an en-suite double bedroom with hairdryer. 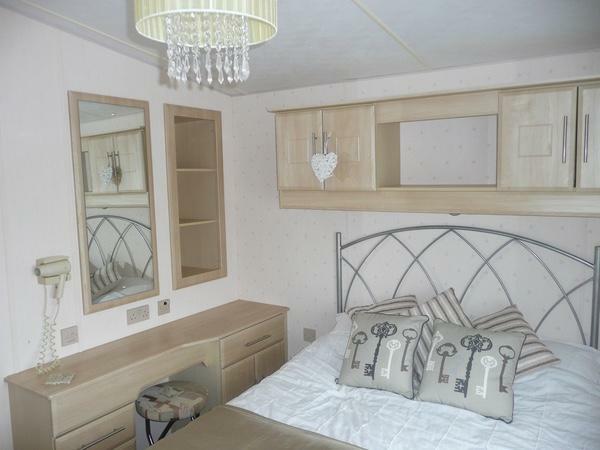 We took ownership of this caravan (AUG 2013) and it has all new kitchen utensils and duvets. All the bedrooms have TV with freeview and both the twin rooms have TV / DVD combo.You will find a large selection of DVD's movies in the television draw. The lounge has a large TV with freeview and Sky. The central part of the lounge has an elegant fireplace which gives a homely feel. The sofa is also a double pull down bed (Brand New 2013). Our kitchen has a very traditional feel with plenty of worktops and several cupboards. We have a separate fridge and freezer.The kitchen has plenty of pots and pans including a Paella pan. We are very proud of our holiday home at Greenacres on Black Rock Sands beach, which feels more like a home than just a caravan. It has a central door entrance and with the open plan aspect that gives your family plenty of space. You will find a selection of family board games in the main cupboard. 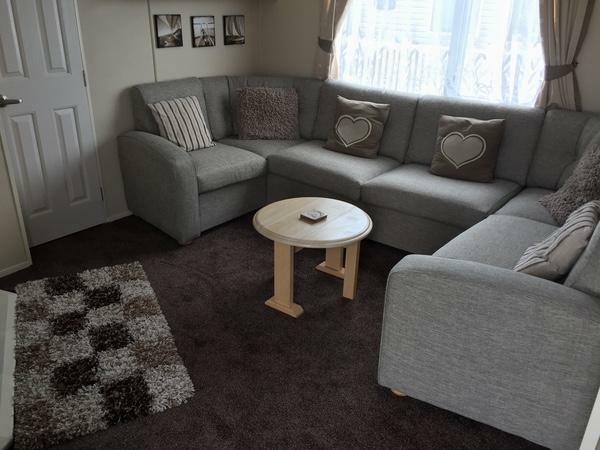 The caravan has a decking to the side and rear of the caravan with plenty of space to sit out and enjoy your meals.We have added a corner rattan sofa this year and an all weather picnic bench The decking area at the back gets the sun from early morning until late in he evening. We have a storage box with beach chairs, portable coal BBQ, Windbreak, bats & balls, buckets & spades, scooters, chimney, Patio umbrella. We require a 20% non refundable deposit to secure your booking and full payment within 4 weeks of the reservation. A £50.00 breakage bond which is refundable if no damage has occurred and the key have been returned. 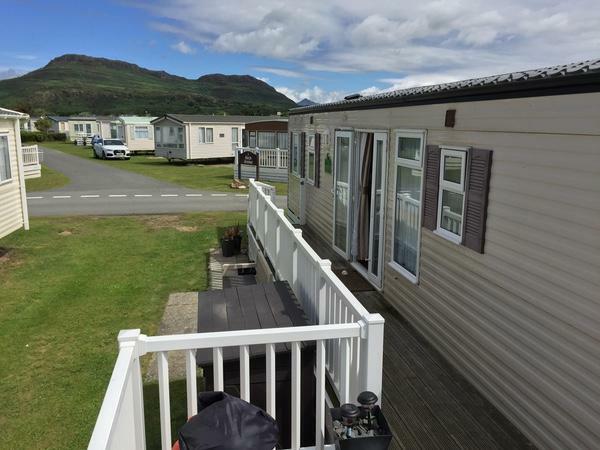 We really hope that enjoy renting our holiday home and relax in the stunning North Wales coast line!!! 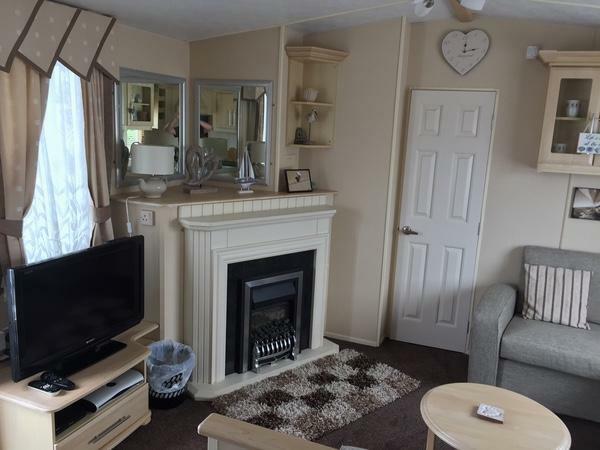 We have just returned from a long weekend at the caravan and would just like to say that the caravan is excellent and suited our needs perfectly and represents great value. 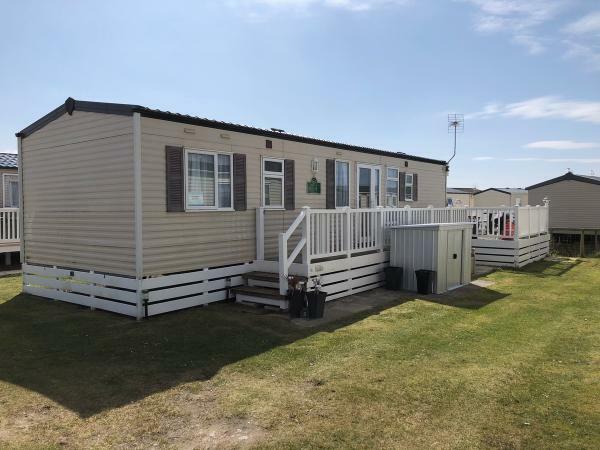 Its in a lovely area, and very close to the beach with lots of extras within the caravan including sky sports which was handy as it rained quite alot! Thank you for your kind review and we are really pleased that you enjoyed your stay. We very much hope that you will consider booking with us again. Thank you Kate for your review we are really glad that you enjoyed your stay at our holiday home. We look forward to welcoming you back in the future. Just back from a fantastic weekend, even though the weather wasn't fantastic we had plenty to keep us busy on site. Greenacres kept the kids happy with a Halloween party, swimming and soft play. We appreciated the personal touches like the board games, decent fridge and freezer space and more TVs than I thought could fit in one caravan! We also enjoyed the beach, though the kids needed their waterproofs and even our three year old managed the walk there in less than 5 minutes. Definitely planning to return next year and will be hoping to rent the same van. Thank you for your feedback. We are so pleased that you enjoyed the weekend despite the weather. We look forward to welcoming you back soon. We've just returned from a fortnights holiday. So much to do there, walks, exploring, beaches. My partner is more sedate, so he also enjoyed the Sky tv and generally relaxing in the comforts of the caravan - or 'home' as we came to regard it. 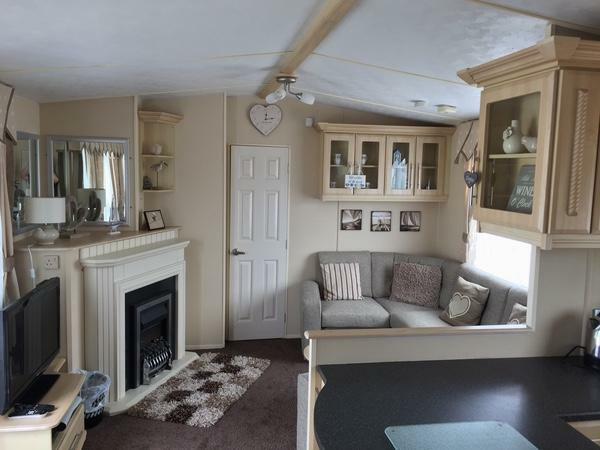 A lovely caravan,spacious,clean, comfortable and containing all the 'little things' we usually have to go out and buy - like sugar and salt, tea and coffee! Everyone mentions the ducks. They are delightful, so nice to step out on the decking with my morning coffee and be greeted by gentle quacking.I loved it there and forgot all my woes. Hopefully, I'll be back! So pleased you both enjoyed a relaxing times and we also love seeing the ducks in the morning. We very much hope that you will return in the future. Thank you for your lovely feedback. Came back to the site after 15 years and we picked the perfect caravan to spend our week here! Everything you need and more including Sky sports :) Booked the caravan quite late and Stephen was very helpful in accommodating our needs. All essentials were provided for a family travelling with a two year old, caravan was clean and comfortable and would not hesitate in recommending this to any family. Thank you Scott for your kind review. I must admit adding SKY TV this year has been a real bonus especially if the weather is poor. We really hope that you will book again with us in the future. Thank you Larry for your kind words. I must admit we love having the ducks for feeding. Really glad that you enjoyed your week and hopefully you will book with us in the future. Just returned from a 4 night stay, would have stayed longer if we could!! Great caravan facilities and lay out of van, agree with last review re cleanliness , however this would not stop us from booking with you again. Found the location great. Enjoyed the board games too, think you have thought of everything, thank you. Thank you for your feeback. I am going to have a meeting with the cleaning company this week as previously we have been credited on how clean the caravan is. We hope that you will book with us again. Sorry for late review i thought i had done one. Beautiful caravan nice location not close to lots of noise when trying to get a toddler to sleep. Ideal bedroom set up as my mum had master bedroom and myself and little boy had the other rooms. My son enjoyed feeding the passing ducks and cost me a fortune on bread. Beware if windy when opening the door as it slammed back and i felt terrible about breaking the door fasten. Very helpful owners and site staff also friendly and helpful. Would definatley stay again. Thank you so much for your review and really pleased that you looked after my ducks. We look forward to you re-booking with us again. A good base for a week. Excellent facilities. Excellent position on park, although stagnant water stream behind caravan led to insect bites. Cleanliness could have been better on arrival. Overall I would recommend staying here. Thank you. Thank you for your review on our caravan. We have a cleaning company that cleans the caravan so I will speak to them about your comments. We very much hope that you will consider using our caravan again in the future. Great caravan. Bedrooms are either end a great idea.everything you could need provided. We were blessed with fantastic weather.enjoyed sitting on the decking watching the ducks in the stream.short walk to the beach and facilities.will definately be back. Thank you very much for leaving your feedback and we hope that you will visit us again soon. Excellent caravan, very clean and fully stocked with all the necessary equipment to make your stay an easy yet comfortable one! A lovely homely feel, sky TV and all mod-cons. We enjoyed walking along the beach into Porthmadog for a pint, then relaxing on the decking in the sun. Shop onsite had everything that we needed, totally recommend the fish and chip shop, can't comment on the other site facilities as we didn't use them. Perfectly located for our short break, hope to visit again and maybe stay a little longer! Owners Louisa and Steve just a phone call away if you need anything, another bonus. We are really glad that you enjoyed your stay and we very much hope that you will stay at our holiday home again. 1st time at Greenacres site good facilities and entertainment especially live band JUMP SHOWBAND played a very good mixture of 60/70s and modern music. 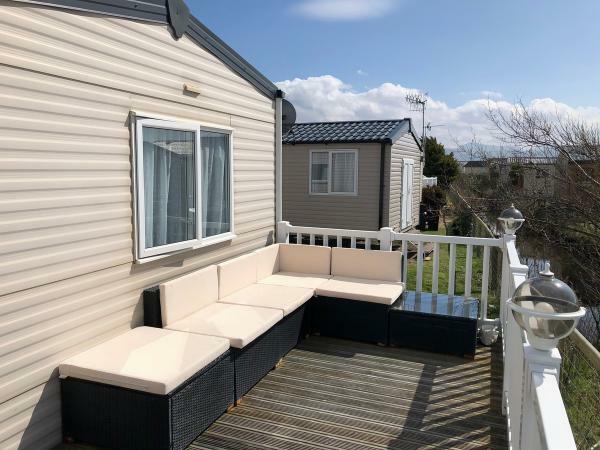 Caravan is BRILLO everything you would wish for,and is in a quiet part of park with beach only a few minutes walk away. Oh if you could only order sunshine for your hols,still did not spoil our break. The owner Steve is only a phone call away if you have any probs,and is very helpful. Would definitely RECOMMEND and look forward to coming back in Steves caravan. Thank you John for your kind review and I am glad you enjoyed all the facilities. We look forward to welcoming you again and maybe next time you might have a bit of luck with the weather. Had a lovely couple of nights away. Perfect location within seconds from the beach, overlooking a small stream from the decking. End of september but still ate outside, with the furniture provided. Only 2 of us but easily accomodates a family. Nice and quiet part of the site but access to all amenities not far. 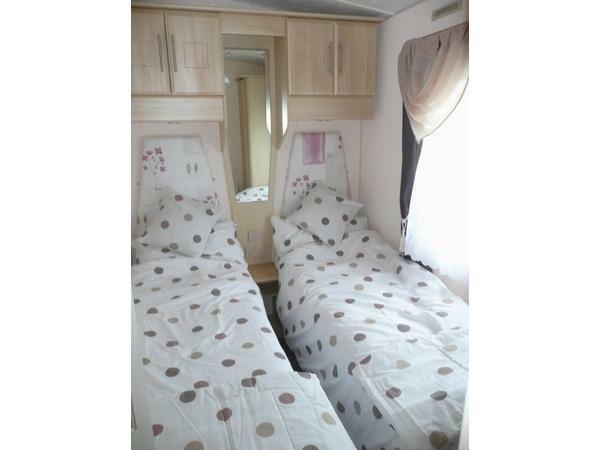 Very well equipped modern caravan, would consider going again. our stay was lovely and homely thank you. I felt settled straight away :) The caravan was bright, fresh and clean.... I felt spoilt :) it was fully equipped plus a TV in each room :) The location to the beach was just a few mins walk. The fully fitted kitchen and fully equipped kitchen made my life so much easier, thank you. It surely was a home from home and look forward to returning very soon. A big thank you from both of us. Both my husband and I, grandson and mother stayed at this caravan last week (w/c 15th September 2014). 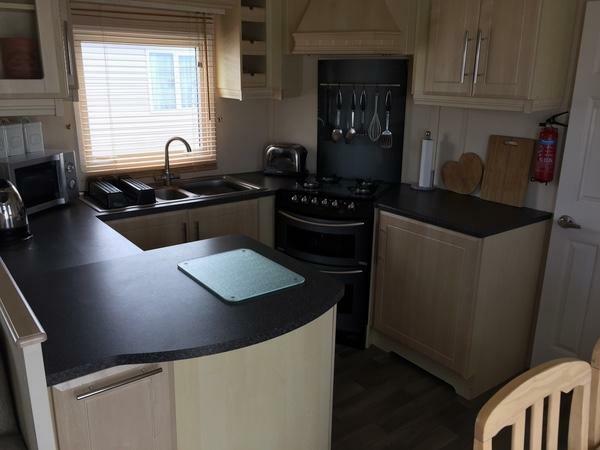 The caravan was great, it was very clean and had an en suite shower/bathroom with the main bedroom (double) and another shower/bathroom at the other end which was invaluable. It meant my mother who is approaching 80 could use the bathroom and have her own privacy. The caravan was of good size and very well equipped, with everything you need, especially the kitchen area which had large fridge, freezer, oven and all cutlery provided. There is also a TV in each of the bedrooms as well as in the lounge. The verander was a plus with a toddler of two years old, he could ride his bike around the side and back of the caravan. We was lucky and blessed as the weather was really hot for this time of year, got up to 24 deg c, so we had breakfast outside on the verander on the table and chairs provided with this caravan. The beach was also only a few minutes walk away which was ideal for us. The site itself was very clean and tidy. One thing I would mention is the cost of the day passes from haven which cost us Â£17 each even though we was only there for three days, we would have been better off purchasing as and when we used the complex. We only went to the complex a couple of times as we ventured out and about in the car. It was lovely to go at this time of year too, when the school children are back at school. All in all I would recommend this caravan and site. Steve & Louisa are very easy to deal with and answered my queries even though they themselves were away on holiday. If Greenacres could ensure wifi for all at their holiday park, this would be the best site we have visited. We went with 4 children aged 8 years and below and they loved it. The holiday park had everything we needed to keep the different age groups entertained. The camp is very clean and the staff very helpful. It is smaller than other Haven camps we have visited but we found this better for us and having such direct access to a beautiful beach really made the week lovely, especially since the caravan was so close to the beach too. The caravan was spotlessly clean and very well equipped for a family. We cooked every night in the caravan and found the kitchen facilities brilliant (the pans, trays, utensils etc that were there were excellent compared to all other caravans we've been to). 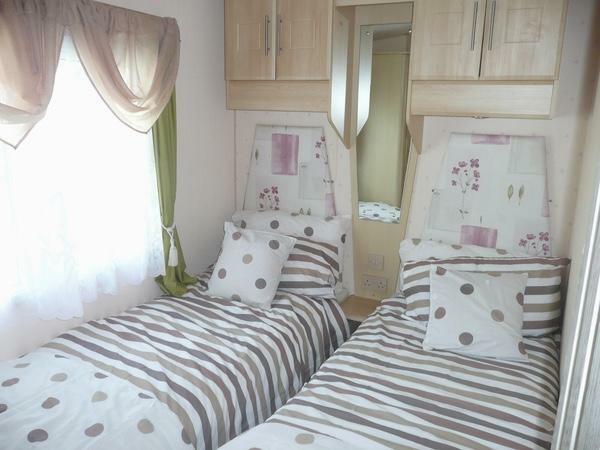 The caravan is in a lovely location on the park and truly can't be faulted. I would definitely book with them again. The owners were really helpful when booking and got back to us promptly with any inquiries we made. Thank you. We really thank you for posting such a positive review and we are so glad that you enjoyed your stay at our caravan on Greenacres. We look forward to you re-booking in the future and hope that you enjoy the rest of the summer. Mom myself daughter and grandson had a lovely weeks holiday in this caravan everything we needed inside and outside and location everyone came back chilled and happy. Really glad that you all enjoyed your stay at the caravan. Hopefully we will see you again it the future. Thank you so much for your review. I agree that Wifi would be a big advantage and Greenacres have said that it is something that they are looking at. I will mention it again to the facilities team next time I am at the caravan. We look forward to hearing from you in the future. We had a great holiday and the caravan was probably the best we have ever stayed in. It was clean, comfortable and had all the facilities you would need including two bathrooms which is great if you have kids. The beach was nearby too and so you can walk there without needing the car. In addition the whole site was very well maintained and we didn't spot any litter. Thank you Mark for your kind comments and really glad that you enjoyed your stay at our caravan at Greenacres. We hope that you will consider booking with us again. Perfect weekend away! Booked & paid last minute, with having 2 babies under 2 the veranda was perfect for our toddler to run around! Clean, modern & fresh! Will definitely be booking again as it made our stay at Greenacres fab! Thank you so much for the kind review and we are glad you enjoyed the caravan. We look forward to hearing from you again. WHAT A FANTASTIC HOLIDAY! THE CARAVAN WAS MODERN WITH CENTRAL HEATING (A DEFINITE PLUS WITH YOUNG CHILDREN), VERY CLEAN, ROOMY AND EXCELLENT VALUE FOR MONEY, ESPECIALLY WITH THE VERANDA. THE CUSTOMER SERVICE WAS FANTASTIC TOO! EVERYTHING WAS EXPLAINED IN DETAIL AND WITH EVEN A PLOT CHANGE, WE WERE INFORMED FULLY OF THE NEW PLOT DETAILS. WE WERE NOTIFIED OF ALL PAYMENTS RECEIVED BY THE OWNERS AS WELL. I WOULD HIGHLY RECOMMEND THE CARAVAN AND WOULD LOVE TO HIRE IT AGAIN AT OUR NEXT STAY IN GREENACRES. THERE WAS A DRAINAGE PROBLEM ON SITE WHICH, DESPITE THREE VISITS TO RECEPTION, WAS STILL NOT DEALT WITH PRIOR TO OUR DEPARTURE WHICH I WAS A LITTLE BIT DISAPPOINTED ABOUT BUT OTHERWISE NO PROBLEMS WHATSOEVER. Just spent the weekend at haven in this caravan and its by far the best one I have stayed in. Spotless, modern, and all facilities you need would definitely book it again. Highly recommended. Thank you so much for kind review. We are really pleased that you enjoyed your stay and that you liked our caravan. We look forward to you staying at our van in the future. So nice place for holiday. Good value for one week holiday.We had there everythink what we needed. Just the weather was horrible in that time. Thank you so much for your kind words, Hopefully if you holiday with us again the weather might be a bit better. Greenacres Caravan Park - 20 Hawks Court Booked this caravan 3 days before departure. My wife and I won tickets for the Festival No 6 and didn't like the idea of camping. Owners recently took posession of the caravan and went out of their way to make us welcome.The caravan was immaculate and there was everyting we needed and everything was clean.The site was well kept and appeared to have good facilities - although we only used the shop and the bar. Shop well stocked( local butcher's produce) & usual supermarket items. This would be great for families, especially grandchildren. Excellent. Thank so much for such a positive review.